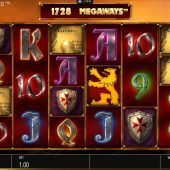 Valletta Megaways slot now means Blueprint have overtaken the originators of the mechanic, Big Time Gaming, in the number of Megaways slots released to date. Here we have a medieval theme based around Maltese knights with the island's shores at sunset as the background and dramatic classical music to spin the reels to. So the epic nature here imitates Blueprint's Vikings Unleashed or Primal and there are elements of Genie Jackpots Megaways too which we shall uncover shortly. Will it be safe to land our bankroll ashore on this fortress island though? There are 6 reels which randomly offer 2 to 5 rows each per spin, meaning 64 to 15625 ways are possible. Symbols, except the Wild and scatters appear singly and stacked too and the 6-of-a-kind pays are 25x bet for the Lion Rampant, 5x Map, 2.5x Shield or Dagger with six card values of 1x for the higher three and 0.5x for the lower three. Your scatter is in the form of a Cannon and appears on all reels with the Knight as our Wild which appears on all reels except the first. Randomly there are two events which can occur at the start of any spin. Firstly, the reels may darken and scatters are added to them all and then the reels stop with only scatters or dark blanks in view. You should find this a short cut to the feature each time. You may also find the reels slow and darken and a win appears. The winning symbols will freeze and the reel will respin until no more winning symbols are added. To help you along, the Knight may fire arrows into useful positions which will reveal symbols to improve the win. Three or more Cannon will trigger 10 to 20 free spins. During these, every win will freeze and offer the respin feature as described above although you won't see the Knight being helpful with his arrows in this case. This is a copy of the Genie Jackpots Megaways Genie Streak Spins bonus modifier. 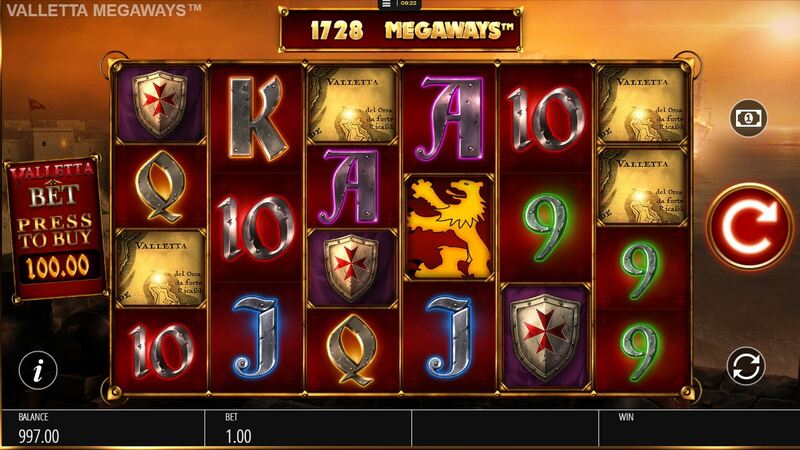 You cannot get any further scatters, but should you fill the whole grid with winning symbols you'll get a retrigger! You can also buy the feature for 100x stake but this is very risky given that the bonus is quite volatile and often produces pays in the 10-40x bet range.